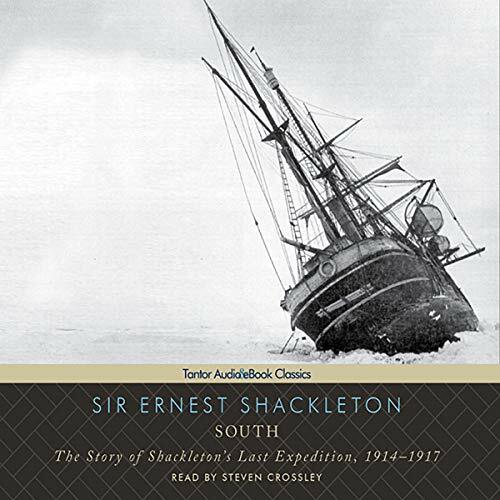 From 1914 to 1916, Ernest Shackleton and his men survived the wreck of their ship Endurance, crushed in the Antarctic ice, stranded 1,200 miles from civilization with no means of communication and no hope for rescue. When the ice began to break up, Shackleton set out to save them all on his heroic 800-mile-trip across the frigid South Atlantic, in little more than a rowboat. Henry Worsley spent his life idolizing Ernest Shackleton, the 19th-century polar explorer who tried to become the first person to reach the South Pole and later sought to cross Antarctica on foot. Worsley felt an overpowering connection to those expeditions. 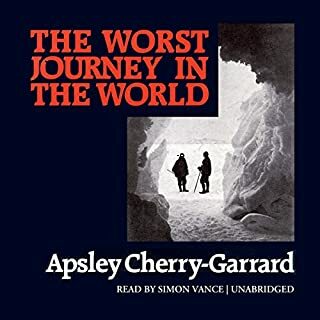 In 2008, Worsley set out across Antarctica with two other descendants of Shackleton's crew, battling the freezing, desolate landscape and life-threatening physical exhaustion. He soon felt compelled to go back. In 2015, Worsley bid farewell to his family and embarked on his most perilous quest: to walk across Antarctica alone. In 1914, Sir Ernest Shackleton sailed south aboard the Endurance to be the first to cross Antarctica. 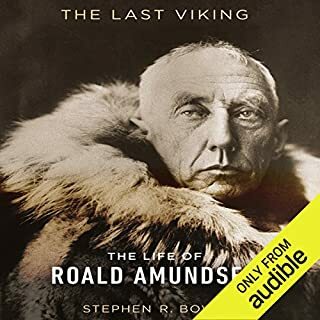 Shackleton's endeavor is legend, but few know the astonishing story of the Ross Sea party, the support crew he dispatched to the opposite side of the continent to build a vital lifeline of food and fuel depots. This unlikely figure entered the rich man's world of polar exploration through an astonishing persistence and succeeded through the same quality. 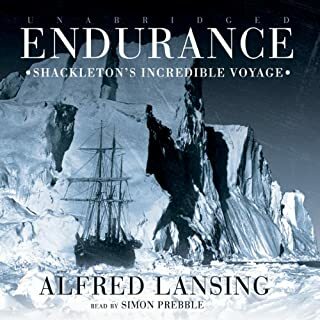 Shackleton's place in history is not the one he set out to make, but his extraordinary deeds have made his contributions to early exploration of Antarctica indelible. Despite the victor's wreath eventually going to another, Shackleton's name is essential to any discussion of Antarctic exploration, based on personal heroism more than logistical triumphs. If there were 10 books that one must read during their lifetime this is one. Leadership, courage and a level head with extraordinary leadership. 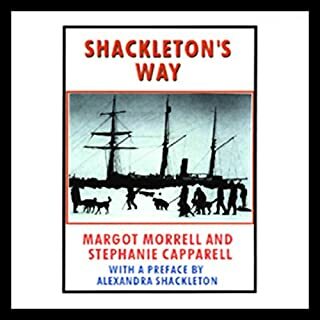 Anyone who leads whether in business or a family can learn from Shackleton's way. I tried listening to this story but it was so slow. I know this story and was expecting something a lot more interesting to listen too. I am not sure if the detail was so much that I felt like the author was trying too hard to paint a picture for the reader. I found my mind wandering and just could not get past a few pages. I suggest listening to the example first to know if you want to burn a credit on this. So as someone who currently serves in the military and travels frequently, I've had this book on my radar for quite awhile. It's a great tale about stoicism, leadership, and staying upbeat when all the odds are against you. But the narrator doesn't vary his voice much if at all, so on longer drives it can get a little monotonous. Also, this might just be me, but there were times parts of the story were retold from a different perspective, and the book (I felt) didn't transition very well between POV's. So that was a little confusing. But overall it's a great story, and frankly should be covered more in history. A REMARKABLE STORY OF COURAGE AND INNOVATION! Man's eternal drive to explore and understand the nature of his planetary space ship has never been more eloquently told. Shackleton's genius extends beyond the scientific. Nowhere do you find demonstrated the art of leadership than in the life story of Sir Earnest. A inspiring and rewarding read. LaMar M. Fox, M.D. Great book! Lots of details! Write it down! Map! Great starter on the subject. Get excited ! There are lots on the way to get close the spirit of our great example of leadership. I first read this account in a 1971 hard back edition. I have read it several times since and now I listen to it. It really is one of the most thrilling and magnificent stories of determination, courage and stress management I have ever had the joy to share. A two year mission cut short before it even starts by bad luck, the elements turning on you with a savage vengeance, no food or resources, a map two compasses and a sextant. No sun for months and a 2000 mile walk into the 40 below zero wind pulling several half ton boats across the ice. Frost bit, hunger, exhaustion and above all courage. From simple ordinary men thousands of miles from home. No radio, no air support, no one even knows you’re in such distress yet. You will be dead before they even know you’re missing. But Shackleton kept this team alive. Feats of navigation that cannot even be simulated now. Seamanship that defies all understanding, but above all a will to survive and a determination to lead. Perhaps we are now too cynical and sophisticated for such a story? And then I remind myself again, this is not fiction its fact. This is courage and adventure and leadership at its best. Written in real time from the diary kept diligently by the great man himself. Dump everything he said before the march across the ice. Where we are going even gold is worthless. But keep your diaries, if dying is the last thing we do, I want the world to find it didn't happen without a fight. Get it, listen to it. It really will change your character for the better. Marvellous. Ernest Shackleton’s own log from his failed attempt to traverse Antarctica. It’s practically all maritime. We learn about the many different kinds of ice & its weird effects, the ship and boats, the sea, the uncanny penguins, the dogs, and each member of the crew and the unbelievable ways they cheated death. The killer whales and the beach of Elephant Island are the stuff of nightmares. . Non fiction easily outshining fiction. Utterly brilliant. Like the Endurance, I was gripped from the start. Awe-inspiring and inspiring. Sublime, in the only sense of the word. the story is what I expected though it took me a long time to get into it and I found it quite easy two doze off to the reader. weather reader is very in Keeping with time period of the book. loved it. the narration was fantastic, extremely evocative of the time and spirit of the men involved in this sounding story. Fascinating, inspiring but a bit long. A classic story of survival.. but quite drawn out, very technical towards the end. 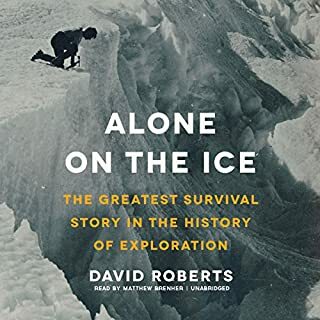 I'd recommend reading until the end of Shackleton's diary, at that point only keep going if you're really desperate for more. An account of a scarily real expedition. Some parts weren’t as exciting as others, describing some monotony / uneventfulness in the days and listing store items, causing me to tune out at times. It did describe the environment well, enabling you to visualise how it must of felt. I also leant quite a bit from the book such as navigation, sailing terms, ways to protect self in harsh environments, and geography. Overall, I enjoyed this book, but not one I would repeatedly listen to. 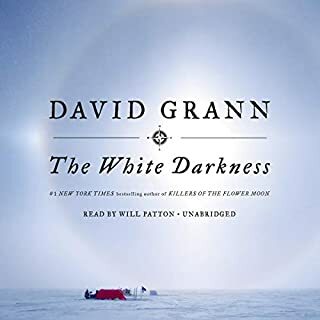 i'd recommend this to anyone who likes survival stories.